Radio advertising salesman Mitch Robbins copes with his mid-life crisis by joining a couple of friends on a two-week New Mexico to Colorado cattle drive. Well-written, well-acted character-driven comedy. The top box office comedy for 1991. 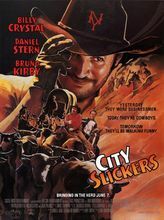 Jack Palance almost steals the show and for his role as old cowpoke Curly won that year's Oscar for Best Supporting Actor. Followed by a sequel, City Slickers II: The Legend of Curly's Gold (1994).